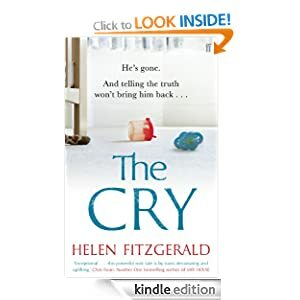 ‘The Cry by @fitzHelen really is extraordinary. In a just universe, it will be her Gone Girl moment. Read it at once.’ Full review here. In the rush to get copies printed ahead of pub date for Harrogate and Edinburgh Book Festivals, we forgot the dedication and Acknowledgements – so here they are. I was sitting with you when I typed The End and then you died. I asked for so much help writing this and I got it in bunches. Thanks to Luca Veste, Sergio Casci, Isabel FitzGerald and Liz Hopkin for reading drafts and giving me excellent feedback. Huge shout to Pete and Vicki FitzGerald, Neil White,. Doug Johnstone, Allan Guthrie and Felicity Pierce for practical advice on criminal law, tampons and the price of coffee in Collins Street. Thanks to my agent, Phil Patterson at Marjacq Scripts, for his notes, diligence and good humour. And to Sarah Savitt at Faber who took this on when it was just an idea and worked like mad with me on it. Mostly, thanks to my Dad, who lived in Point Lonsdale, where this book is set, and loved it as much as he loved life. ~ by helenfitzgerald on August 27, 2013. This book Paid special attention to plot and is fast pacing in this genre. Introduce the murder or the crime early, and research the methods by which the crime was committed.